LINK PYRAMID + LinkWheel = Link Push. I Build Panda & Penguins safe ★Pyramid Wheel★ with 15 Web2.0 properties, 15 Plus Social bookmarking and 15+ Verified edu and gov Blog Comments to those web2.0 properties. Yes, I provide unique/different articles related to your keyword for this HIGH AUTHORITY SEO PYRAMID! 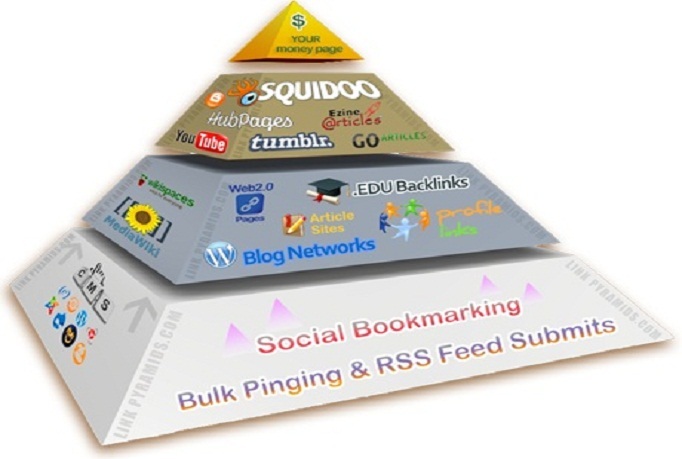 Boost Search engine rankings with MOST POWERFUL PYRAMID ★ link Wheels and SEO FRIENDLY PYRAMIDs only works with Different and Unique articles, (Not Spun using single spun article) ★ I Provide Full Report. Order this gig GIG and Dominate Google! I will create link wheel with unique articles best offpage pyramid for your website is ranked 5 out of 5. Based on 29 user reviews.